I WILL SWITCH LIGHT TODAY. Earth Hour is an international event that aims to draw attention to climate change and global warming. 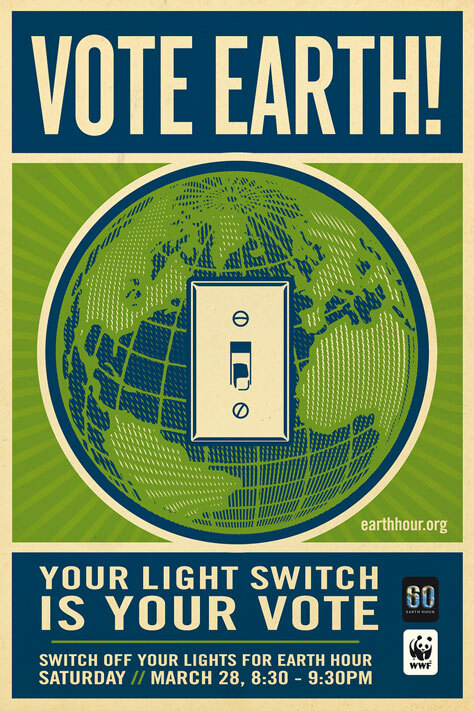 The goal is for 1 billion people to switch off their lights as part of a global vote in the world’s first global election, between Earth and global warming. The results of the vote will be presented to world leaders at the Global Climate Change Conference in Copenhagen 2009. For the first time in history, people of all ages, nationalities, race and background have the opportunity to use their light switch as their vote – Switching off your lights is a Vote for Earth, and is the chance for the people of the world to make their voice heard. Lights are scheduled to go out for 60 minutes at hundreds of popular tourist landmarks and buildings worldwide, including New York, London, Paris, Dubai, Hong Kong, Moscow and Nairobi. We can all have a vote, and every single vote counts. Together we can take control of the future of our planet, for future generations. Also visit Starplaza to get your exclusive one-day-only Earth T-shirt on Saturday. Join the 'Earth.Hour Club' now to find out more, and support this great cause.